I have been playing videogames for at least 30 years now and I have never experienced anything like Pokemon GO. I took the family over to downtown Kirkland yesterday to hunt for Pokemon and we had a blast. It was amazing to walk around the waterfront and meet so many other people doing the exact same thing. A group of boys who saw us playing ran up and told us about a Growlithe nearby. We stopped to get some ice cream and I could hear people outside shouting about an especially elusive Zubat. Everywhere we looked we saw people catching Pokemon and not just that but talking with complete strangers about Pokemon. It was one of the coolest experiences I have ever had. 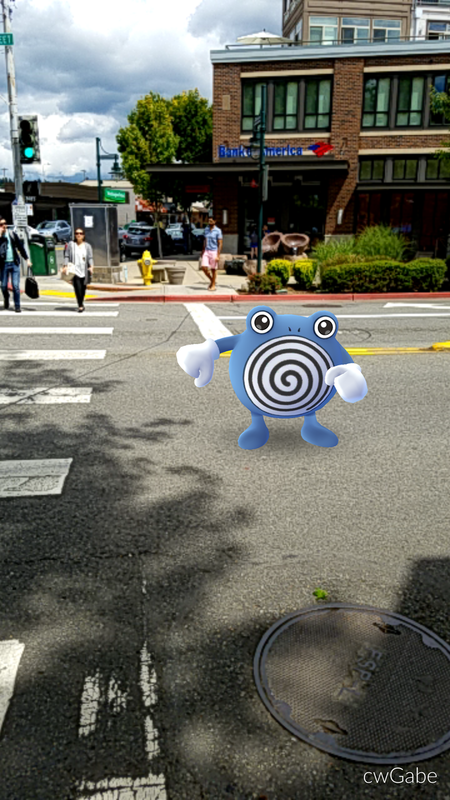 I did nearly get hit by a car trying to catch this Poliwhirl though.